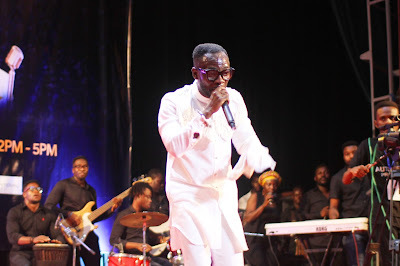 From the show of terrific energy, sheer agility, masterclass stagemanship and an unmatched sophistication, celebrated musician Okyeame Kwame has proven again that he is evergreen and out of his league. At the popular +233 Pub in Accra last Friday, the man acclaimed as the ‘Mr. 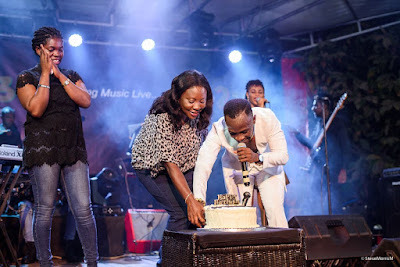 Versatile’ successfully staged the fourth edition of his OK STRIPPED live-band concert – and ended up blowing off his audiences and receiving the plaudits! In a streak of wondrous performances and matured stage presentations, the rapper held his audiences spellbound, and got them debating whether a show at the +233 could get any better. 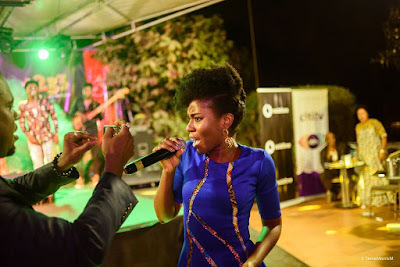 “I am a big fan of live-band music, but what I have experienced here tonight, in terms of the excitement; I think is unsurpassed,” Mrs. Miriam Obeng, a banker, told this writer after the concert. Another patron, Mr. Kwame Duku, who called himself a regular +233 comer, also described the event as the finest he has witnessed. “I pass here all the time, every Friday. I have not seen any night like this. That Okyeame guy is amazing. This is my first time watching him in live performance and I think his show is the finest to come here,” he observed. The OK STRIPPED is a fundraiser concert hosted annually by Okyeame Kwame at the +233 Pub in support of his philanthropic projects, such as his free nationwide Hepatitis B screening and vaccination. 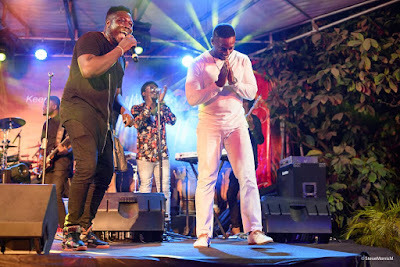 Last Friday’s event, which started from 9 pm till 1 am (Saturday), witnessed performance from not only Okyeame Kwame, but also some of finest artistes who are currently the toast of music-lovers. 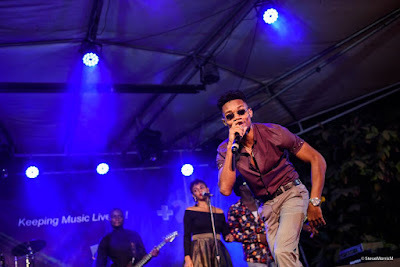 Kuami Eugene, who recently won ‘Highlife Artiste of the Year’ at the 2018 Vodafone Ghana Music Awards (VGMA), proved his mettle by performing not only his songs (i.e. ‘Angela,’ ‘Adwen Fi’ and ‘Confusion’) but also those of Highlife legends like Amakye Dede and Kojo Antwi. 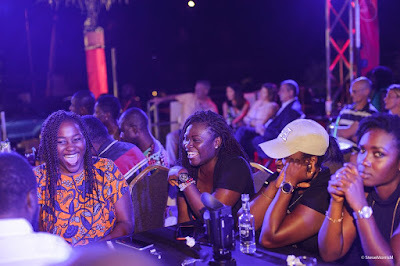 Other performers, viz: Akwaboah, Kidi, Mzvee, Adina, Sista Afia, Abochi, Kurl Song, rapper Cabum, poet RyhmeSonny and comedian Nino, also delivered powerful presentations that got the patrons either trooping to the dancefloor or laughing the lungs out. 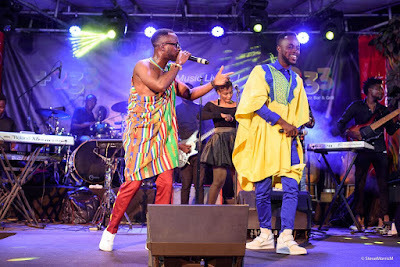 However, it was Okyeame Kwame, the host artiste, who astounded patrons the most, mainly because of the exceptional energy, agility, versatility and the sophistication (in fashion-sense) what marked out his performances. With his presentations interspersing those of the other performers, Okyeame managed to win the hearts of every patrons with one act or the other. Changing into four different costumes on the night, Okyeame added a different element to each performance he delivered, which took the experience of his audiences into a different realm. Certainly, indescribable was the feeling and experience of watching the evergreen Okyeame Kwame perform live some of his classic numbers (eg. ‘Woara,’ ‘Faithful,’ ‘Woso,’ ‘Anaa,’ ‘Masan Aba,’ ‘Tintin To,’ etc) with the High School Band led by the celebrated guitarist Dan Grahl. Also, Okyeame’s leadership in the Hiplife industry was further accentuated by how he worked with the young artistes on the night, sometimes joining them on stage to deliver a duet before their performances ended. Proceeds from the concert, sponsored by telecom giant Vodafone, go into purchasing vaccines for Okyeame Kwame’s free ‘Hepatitis B screening and vaccination’ campaign which the rapper has been embarking upon in the last 10 years.